Probably one of the better known quotes from Sci-Fi TV that ranks up there with "Beam me up, Scotty" and "You have entered...the Twilight Zone". 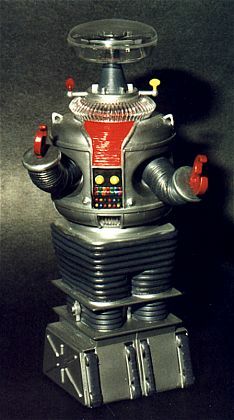 With the release of the movie "Lost in Space", the demand for the original series kits has escalated. The only kit produced for mass markets was the old Aurora kit of the robot and, thanks to Polar Lights, we now have it back. The first thing you notice as you try to open the box, is that this box is strong enough to have a truck run over it without damaging the contents. It is easily 1/8" thick cardboard. The next thing you notice is the smell. Whew!! This kit is molded in ABS plastic instead of the usual styrene and the odor takes a bit of getting used to. Once the box is open, it is time to look at the kit. Shipping had managed to remove most of the items from the sprues, and close inspection shows that the molds were really in need of cleanup. While undoubtedly some was done, there were many areas where instead of crisp corners and crevices, there were blobs. In addition, there was some serious mold match misalignment, especially on the robots tracks. Other evidences of pitting on the molds were rough surfaces and some tiny sections were missing and the inevitable blobs of plastic filled the holes. In case you hadn't figured it out yet, this is NOT a kit for the beginner or faint of heart. Sincethis is ABS, regular tube glue doesn't work. However, Weld-On #3, my adhesive of choice, works just fine as do most 'hot' glues like Tenax-7R. The kit can be built in subassemblies as frankly the instructions are the old Aurora ones and basically is just an exploded diagram. When building the subassemblies, I took a lot of time filling and filing. This was especially needed on the accordion arms and the body where there are lots of convolutions and seams that need work. Patience and a good set of files will win the day. In addition, I brushed Weld-On glue over the seams to soften and blend in the plastic. It worked remarkably well. Painting them was done using various Metallizer colors for the ends and my home-brew tire color for all the accordion features on not only the arms, but legs as well. Once that was completed, it was time to start painting and putting the bits and pieces together. First of all of the kit below the very top was painted Testors Metallizer aluminum. Then the flexible joints were painted with my secret tire color. Once dry these were washed with black. Then the clear bits were installed in the lower torso and when dry the upper 'voice' area that lights up when the robot is talking was painted Day-Glo. When dry it was backed up with white and then installed in the torso. The arms were then installed in various positions. The next parts to be built up were the 'head' area. These bits needed a lot of cleanup and were painted various metal colors. The upper bubble was cemented with Elmer's glue as was the 'collar' area that is clear as well. There are two sensors off on arms that are provided as round bits. These need to be made into oval parts, one horizontal and one vertical. Then one was painted red and the other yellow. The 'claws' were painted Post Office Red. The most glaring error on the kit is the tracks. The kit ones stick out way too far. This was fixed by sanding off the backs to have them fit closer to the body. The treads, which were horribly misaligned, were sanded off completely and replaced with Evergreen strips. These were then sanded down a bit and painted rubber. Final assembly was detail painting of the torso as well as painting and installing the power pack and leg joints. The kit comes with a nice base, but I decided not to use it. 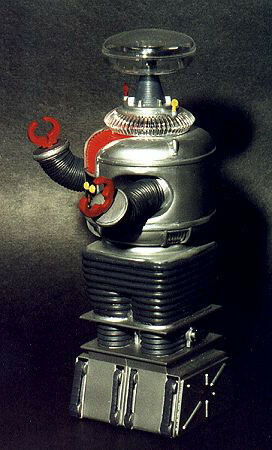 The end result is a very nice representation of the original LIS robot. While not a contest winner by any means, it really is a great conversation piece and looks good on the shelf. Not recommended for beginning modelers.